In early 1957, the San Francisco Chronicle ran a three-part series on the quest of two 15-year-old Elvis Presley fans to meet their idol. 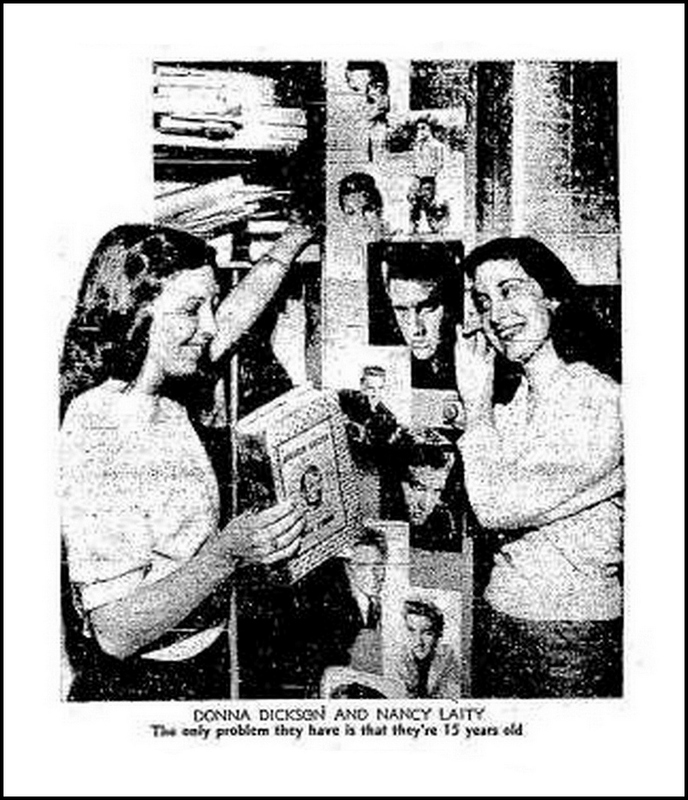 Donna Dickson and Nancy Laity, having failed to get a response after sending Elvis no less than 25 letters, birthday cards, Valentines and telegrams, contacted The Chronicle and pitched their story idea: the paper should sponsor a trip for two girls (them, of course) to go to Hollywood and interview Elvis Presley. “And it wouldn’t cost you much to send us. We won’t even eat!”, they said. The Chronicle, seeing it as a nice publicity stunt, agreed to the idea and reporter Tom Mathews was assigned to record the girls’ adventure. Since the girls were underage, their mothers were also invited on the trip. On this page you’ll find the complete transcript of Tom Mathews’ story as published in three subsequent editions of the San Francisco Chronicle starting on February 27 and concluding on March 1, 1957. 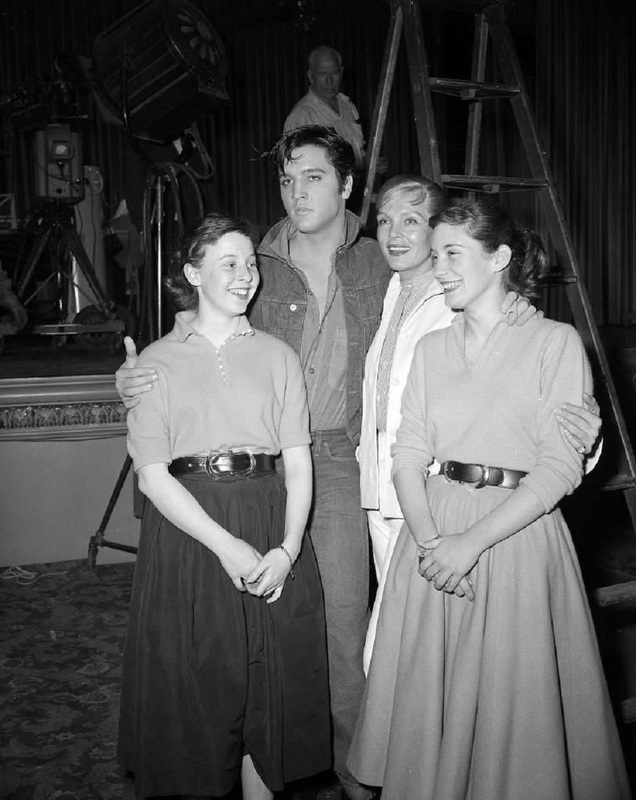 Accompanying the transcript, are (low resolution) images that originally appeared in the newspaper, as well as a nice collection of high resolution photographs that were taken during the girls’ visit to Paramount Studios while Elvis was filming Loving You. 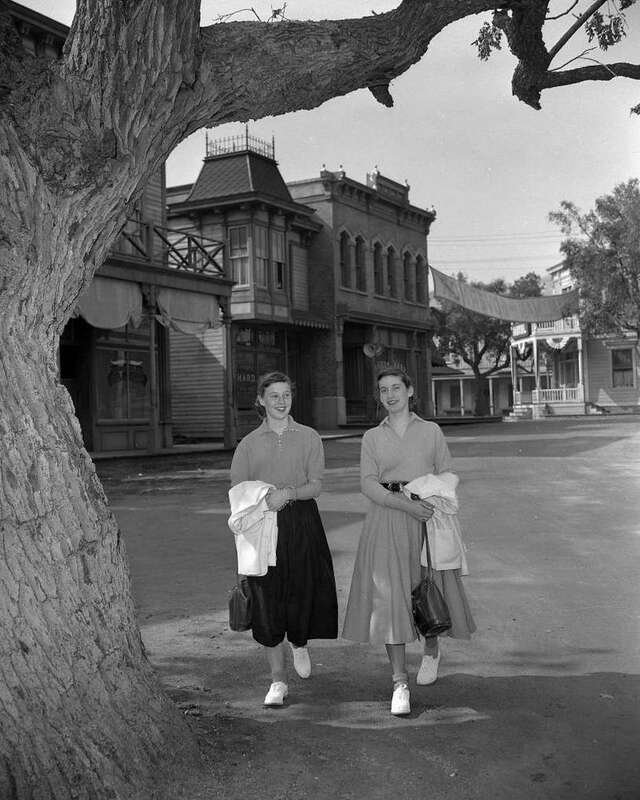 2 GIRLS FROM LINCOLN HIGH GET A PASSAGE TO PARADISE – The Misses Donna Dickson and Nancy Laity are well scrubbed, good mannered 15-years old, sound of wind and limb, clear in the eye, strong in the stride and weak in the heart. They suffered this latter condition in mid-summer when they were struck by lightning while listening to the radio. The bolt was shot by Elvis Presley, the boy Zeus from Tennessee. Since then they have poured on all the pressure their weekly allowances would allow to promote the entertainer. This is a dollar a week apiece. They called station KOBY every day and demanded “Too Much”, or some other swinging rondelay. They spread their finds around the jukeboxes seeking, like a Madison avenue ad executive, to blanket as wide an area as possible. They have given up two complete sets of boyfriends. ELVIS DOESN’T ANSWER – They also developed a sense of futility that would have shattered the minds of a dozen adults. For here they were doing more for Elvis than a full armored division could accomplish and he didn’t even know they breathed. Twenty five letters they wrote, no answer. Birthday telegrams. Christmas cards and Valentines. No response. They laid off the publicity campaign long enough to save money for a three-minute call to Memphis. No answer. They tried Hollywood. No answer. Elvis was protected from everybody but his mother. Miss Dickson and Miss Laity wrote The Chronicle. The guile in the letter would have served a Borgia. “We have a great idea for you”, it read. “Why don’t you sponsor a trip for two girls, namely us, to go down to Hollywood and interview Elvis Presley? We think The Chronicle is the best paper in San Francisco, and it wouldn’t cost you much to send us. We wouldn’t even eat and that would save money … “. THEY CAN GO – Inquiry showed the girls had no problems except that of being 15. “They are above average students and good citizens”, says Mary Welch, assistant principal and dean of the girls at Lincoln High School. Two weeks ago, the girls were told they could go. They went to Mass the next day. Miss Dickson lost five pounds in the interim and Miss Laity gained four. The day before they left this reporter went out with them to spend their last school day before the trip. Lincoln High throbbed with the story. The student body split pretty evenly on whether they were fortunate or out of their minds. Generally the boys held the latter opinion. William Witt, their English teacher, had to give them a test early. It was on Cyrano de Bergerac. “Mr. Witt said the other day he didn’t like Elvis”, said Miss Dickson, “I said at least you’ve got his hairdo”. “And I said he’s got more than one sport coat”, added Miss Laity. ELVIS IN THE CLASSROOM – They walked into Mr. Witt’s classroom and sat down. He smiled and took up the test questions. Either he was forgiving or he had forgotten. “Whom does Cyrano accuse of making love to a musketeer in a bakery shop?” he asked. “Mr. Witt, do we have to have the right spelling?”, asked Miss Dickson. “You cannot spell Cyrano E-L-V-I-S”, said Mr. Witt with enjoyment, proving every houn’ dog has his day. After the test the lunch bell rang and they went to the cafeteria. Many girlfriends gathered around their table and asked how they had been chosen to go. Some of them were quite snippy. “I don’t know who else got a better right”, said Miss Dickson. “We saw ‘Love Me Tender’ (his only picture) three times the first day, once the next and three times the day after that”. NO TEARS FOR ‘FISH LIPS’ – She admitted that she and Miss Laity saw the work only occasionally thereafter. “We cried the first three times and the fifth time”, she added. They said they had memorized the dialogue of the film and are fond of quoting such famous lines as “You ain’t got no right to do this” or “Shut up, I don’t want to hear no more”. A young man with an athletic air came up to the table and asked if it were true they were going to see Elvis “in person”. His name was Jim Bender. They said yes. “I think he’s weird”, said Jim. “Simple. Beautiful”. No word is so contemptuous as “beautiful” at Lincoln High School. “Shut up, I don’t want to hear no more”, the young ladies said. It fractured everybody. Jim retired, mistified by the convulsions. Two sticks of fingernail whitener, one lipstick brush (“I’ve never use it because it won’t work right”), a muni ticket, an eyebrow pencil, a pair of dice, a champagne cork, perfume, a coral lipstick, a Presley “Tender Pink” lipstick, a Futurama lipstick, two makeup sticks to lighten the lipsticks, an eyelash curler, tweezers, a buck bag to clean shoes, a set of colored pencils for biology, a rol of Scotch tape, a mirror, one bobby pin, a calender, mascara, two pens, two fingernail files, a ruler, a key to a diary, an eraser shield, pearl fingernail polish, a comb, an eraser, an address book, a basketball game schedule, a pencil, a fitted manicure set, a handkerchief, a three-inch-thick wallet, and a one-inch-thick wallet. “Mine’s about the same”, said Miss Laity. “We both got every one of his records, and we both got budgies named Elvis”, said Miss Dickinson. They said that in each case, the budgie Elvis had a girlfriend named Elvisa, but that the Elvisas died. The two girls did not seem too unhappy at the disaster on the distaff side. Miss Dickson added as an afterthought: “We hate Natalie Wood”. 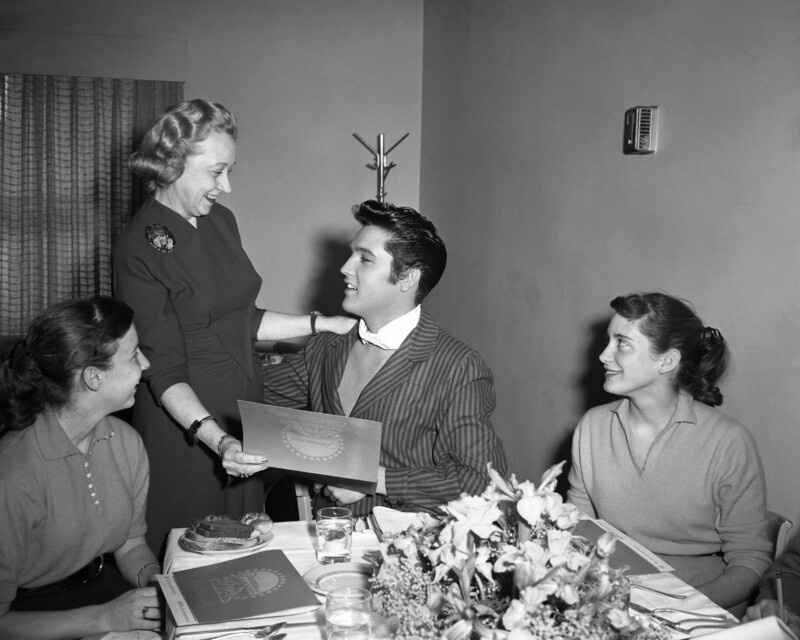 Miss Wood has had several publicized dates with Elvis. “My mother got a new suit for her trip”, said Miss Laity. “My mother couldn’t make up her mind so she sent a suit and a dress to the cleaners”, said Miss Dickson. “Then last night she looked up with the telephone book and said, ‘I’m looking up the Elvis cleaners,’ isn’t that funny?”. Both agreed it was. The girls went off to gym where their teacher congratulated them and asked if they needed a chaperone. They said no, their mothers were going. “Well tell him I named my car Elvis”, said the gym teacher. “I think he’s adorable”. “Do you feel kinda nutty about all this attention?”, Miss Laity asked Miss Dickson. “I do, but it’s worth it”, said Miss Dickson. “But you know what’s going to be horrible? Coming home. Now we’ve got something to live for. Tomorrow it’ll be all over”. “What if he turns out to be bad?”, asked Miss Laity. The thought made her shiver. “They say he isn’t”, said Miss Dickson, in a no-nonsense tone: “I don’t believe those nutty psychiatrists. Elvis says “ma’am” and “sir” and he doesn’t smoke or drink or do anything”. “In a way I kinda hope he’s not too good”, said Miss Laity. A REAL NERVOUS DAY FOR TWO PRESLEY FANS – Mrs. Dickson: “I thought I was pretty calm until last night”, she said. “I had to get a suit spotted and found I was looking up the Elvis cleaners”. She said she then changed her mind about the suit and choose a dress. At 1571 25th Avenue, Miss Laity opened the door with such vigor she almost tore the jamb out. She had forgotten to loosen the chain. “Take it easy Nancy“, cautioned her mother. FALLING DOWN NERVOUS – Mrs. Laity then admitted she was a little shaky herself and prove it by falling down the steps. She ran out her both new alligator pumps. “Well, that’s starting off things with a bang”, she uttered and limped in the car. Mrs. Laity assured her daughter that if she had broken both ankles they would have gone anyway. “I’ve got a stomach ache”, said Miss Laity, anxious to share her mother’s misery. “And I’ve got blisters”, said Miss Dickson. Both girls had purchased new white oxford shoes in the hope that Mr. Presley would adorn them with a signature. It was the first plane flight for Miss Donna Dickson and Miss Nancy Laity. Both were nervous. But they looked like transatlantic pilots compared to their mothers. 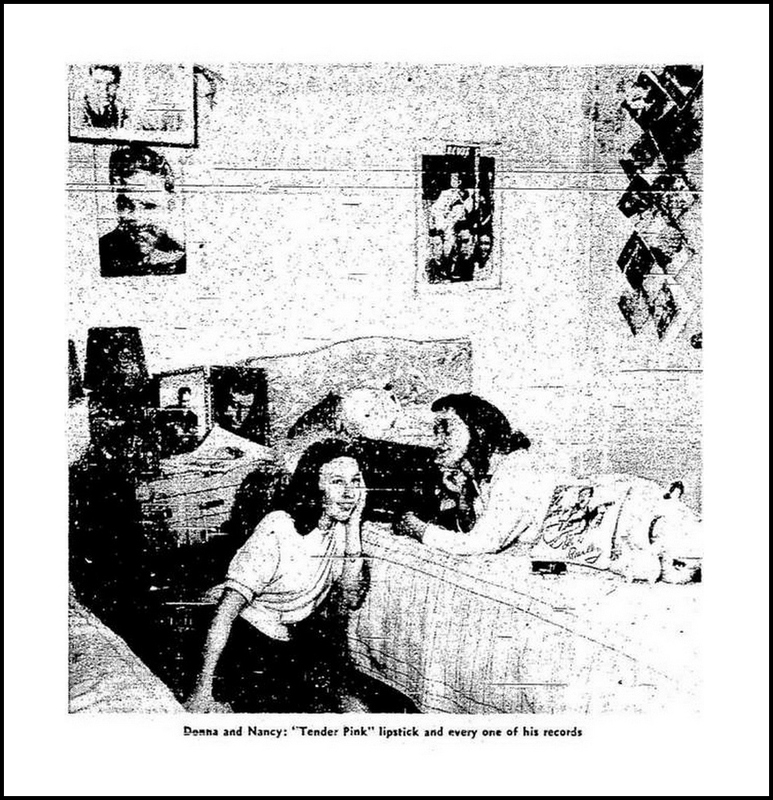 Mrs. Robert Dickson and Mrs. Harold Laity were equally new to air travel and they did not possess the transcendental purpose of their daughters. It was this purpose, a visit to Elvis Presley, that caused them all to get up at 5 A.M. on a stormy morning. Guests of The Chronicle, the mothers were to act as chaperones and also as nurses in case their daughters fell apart. And in case you just came in from an Antarctic cruise and don’t know Presley from Pepsodent, you should realize that eight of his records have passed the million mark, that he receives 4000 fan letters a day, that RCA executives are afraid he’ll learn how to sing and that he has 40 sport coats and four Cadillacs. Many people think Elvis is a pain and some think he’s a menace. There are more who believe he is a shrewd entertainer and there are others who think him the sweetest thing to come along since the invention of the strawberry soda. Miss Dickson and Miss Laity must be counted among these. There was calm and thoughtful silence until the party boarded the plane. The TWA stewardess came by, asking for last names and destination. A PHILISTINE – “Are you going all that way just to see him?”, asked the stewardess, obviously one of the enemy who rates Presley somewhere between bad manners and marijuana. “There’s always ONE around”, said Miss Dickson, looking prim. Both girls consider attacks on Elvis as assaults upon themselves. “I don’t see why so many people are always knocking him”, said Miss Laity. “We like him and we aren’t juvenile delinquents”. “They don’t like the way he wiggles”, said Miss Dickson. “I don’t especially like that”, said Miss Laity, “but then it’s awfully hard to do and you will have to give him credit for that”. “You know”, said Miss Dickson, “one day when we had nothing to do, you know like when you decide to go on a diet or something, well, we played every record and danced. You know how he wiggles. Well, he does that for twenty minutes on an appearance. Well, we did it only one song and we just had to lay down on the rug we were so tired”. A FAIR SHAKE – What Miss Dickson called “the Presley wiggle”, has caused near riots all the way from New York to Oakland. More than 12000 teen-agers crowded his hometown of Tupelo, when he appeared there. They turned a county fair into pandemonium. Three thousand youngsters stormed his dressing room in San Antonio and 15,000 showed up to squeal at him in San Diego. He was the first personality to trounce the Ed Sullivan show. He appeared with Steve Allen one night during the summer and Sullivan’s Trendex rating went down so much he signed Elvis for three appearances for a reported $50.000. So you can’t blame Miss Dickson and Miss Laity for some of their enthusiasm. Over Santa Barbara, Miss Laity became pensive. A fly walked across her window. “That poor little fly”, she said. “It’s so far from home. Isn’t it funny they don’t even know the difference”. As the plane let down over Los Angeles with the mothers completely calm and the girls utterly giddy. Smoke arose as if from giant fires or a bombed city. Mrs. Laity had a momentary return of panic. She couldn’t get one of her new shoes on. The foot had swollen. Grimly she shoved and with the courage of a Marine walked off the ramp to the waiting limousine. THE LAST LAP – On the way to Paramount studios a stop was made to replace the new alligator pumps with something sensible. The limousine driver, Jack Jamieson, said he had taken Elvis home in that very car. “IN THIS CAR!”, Miss Dickson and Miss Laity squealed, “Where did he sit?”. Jamieson pointed to Miss Laity’s seat. Miss Laity levitated 18 inches to the roof of the car. “Everybody likes him”, said Mr. Jamieson. “He’s very nice and not like some of his publicity. The electricians and grips like him which is always a pretty good indication of what kind of a guy a celebrity really is”. “Oh boy, this is livin’“. said Miss Dickson. She pushed one of the buttons and when it operated a window, she nearly had a fit it was so funny. The windows went up and down all the way to the studio. Mr. Jamieson is a very patient man. Up Latijera Boulevard and La Brea Avenue to Wilshire where the girls had to let up on the windows a little because they were gulping like fish. “I hope we act human”, said Miss Dickson. “My mouth hurts from smiling so much”, said Miss Laity. TOUR DE FORCE – Lindsay Durand, Paramount publicist for Loving You, the new Presley movie, greeted the limousine. She had arranged for a tour of the studio before going to the Presley set. The girls made the tour in record time, goading all the adult like mahouts. On the set they met several of the people in the movie but not Elvis. He was coming later. Shown his dressing room, Miss Laity said, “Look, he’s got a football”. Miss Dickson was too reverent to speak. 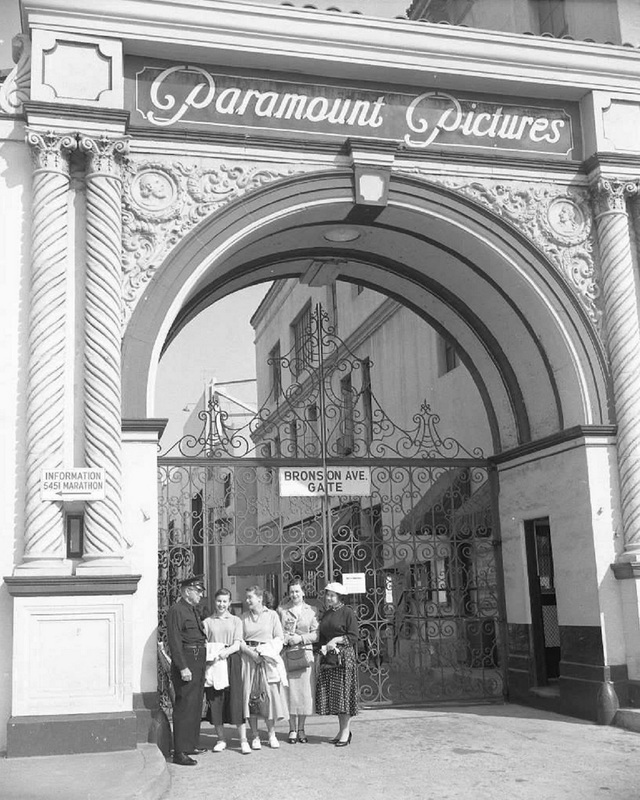 They returned to where the cameras were operating and were introduced to Dolores Hart, the feminine lead. “What does he say about the kids who like him so much?”, asked Miss Laity. “Not much. It embarrasses him”, said Miss Hart. MOMENT OF TRUTH – “Oooooooooh, there he is!”, said Miss Dickson. Elvis was about 30 feet away and surrounded by the technical crew. He had been primed by Miss Durand. He pushed out of the circle and walked forward throwing them a salute with his hand. He clucked a couple of times with his tongue and said, “Hi babies, let me take you to lunch”. Hand to mouth they could only stare. Each nodded assent, and the stars that come from tears shone in their young clear eyes. When Elvis Presley asked Misses Donna Dickson and Nancy Laity to lunch, they said they “almost died.” It is the only time the studio has recorded the sound of two human swallows. While breathing shallowly, pulses fluttering, stomachs knotted and faces pale, they walked to their table. Seated with their mothers in the special dining room of the Paramount commissary, where Elvis had said he would join them later, they were near recovery. They were half way through their hamburgers, milk shakes and French fries. “This is the best day of our life”, said Miss Dickson. “My stomach is growling”, said Miss Laity. “I hope he doesn’t hear it”. 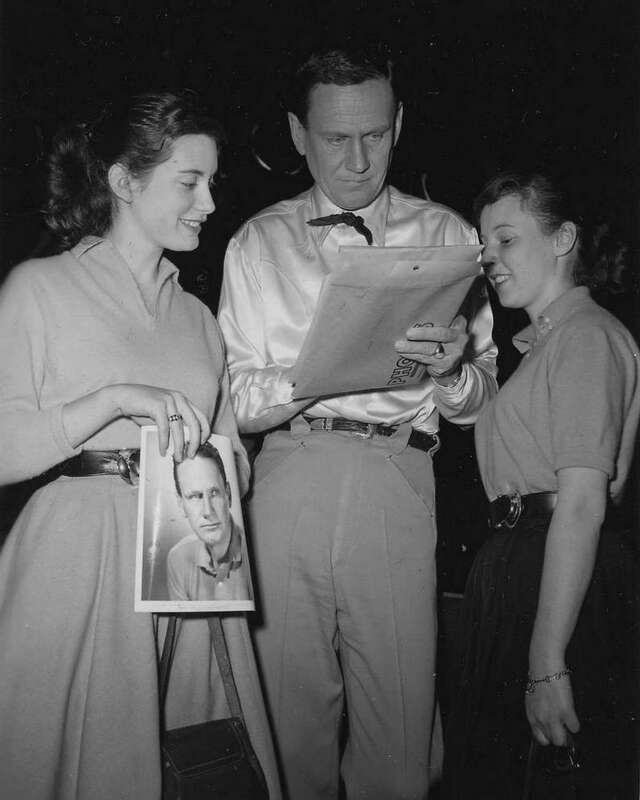 “I’m going to ask him when does he go into the Army and about Natalie Wood and what is his favorite color”, said Miss Dickson. 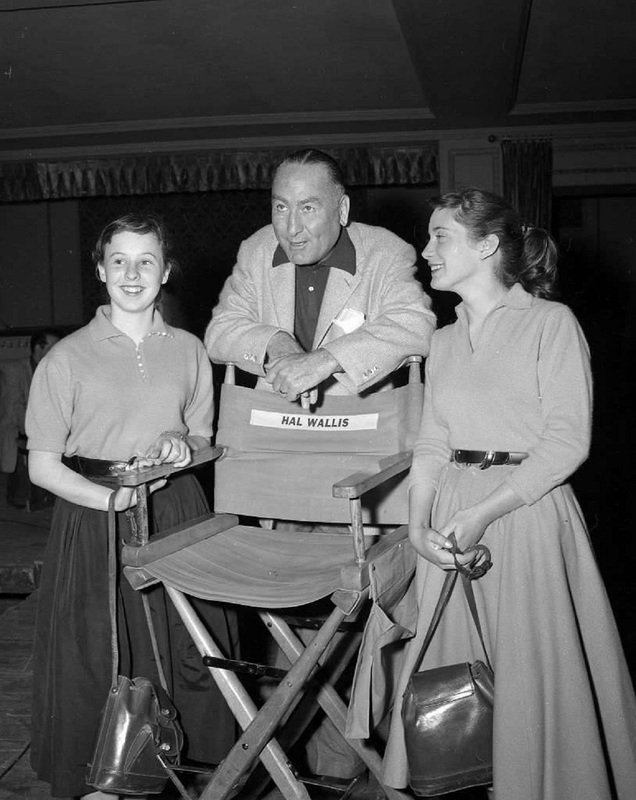 “What can we ask him about Natalie Wood without sounding stupid?”, asked Miss Laity. 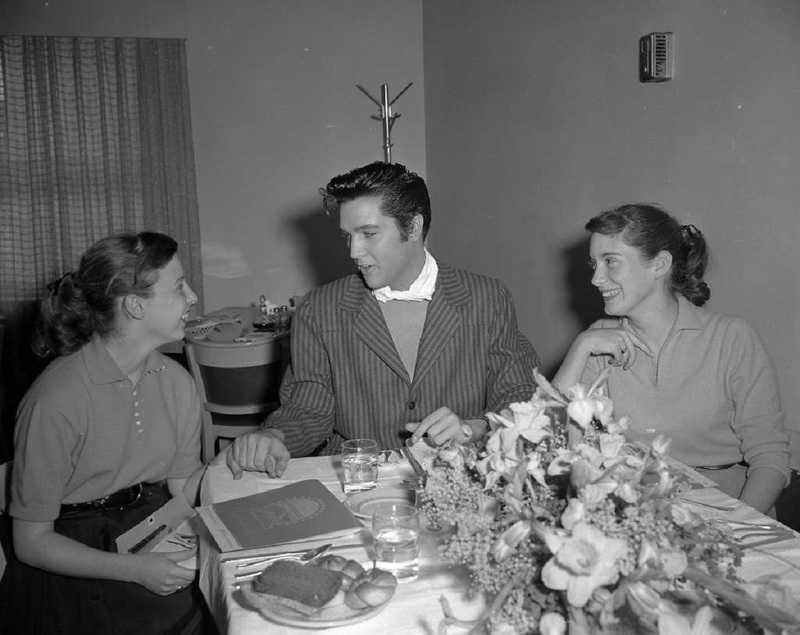 Miss Wood had been known to have dates with Mr. Presley. “Let’s ask him if he cares about somebody”, said Miss Dickson. “That way he won’t know who we mean”. “You see all these real famous people here like Wendell Corey and Lizabeth Scott and they’re nothing”, said Miss Laity. “Ooh, there’s Yul Brynner. Hey, ma, there’s Yul Brynner”. The mothers couldn’t have been more delighted. They looked with bright interest. “Look at them look at Yul Brynner”, said Miss Dickson. THEN THERE CAME ELVIS – “Ah found ma thrill”, he sang and sat down. “Ah got a sore throat from singin’ too late last night”, he said. He was in Apache-brown makeup, a white handkerchief knotted around his open neck to protect his sport coat. Rust gabardines and black loafers completed his uniform. He is impressively tall and his hair no longer looks like the rear of a duck. It is very long, very sleek and very black. The forelock still hangs in front. “D’you get out of school today?”, he asked. “Yes”, they said. “We saw your picture 11½ times”. “Couldn’t you stay through the last time?”, Elvis asked. “We came in during the middle once”, Miss Laity explained. Elvis ordered a glass of milk. His fingers drummed incessantly on the table. He reached over and took a sip of Miss Laity’s milk shake, Miss Dickson looked stricken. He took a sip of hers, too. The milk shakes vanished immediately. To questions, he said his favorite song was “Don’t Be Cruel”, his favorite color was black and that he had not heard from the Army. “Ah’ll go where they put me”, he said. “If it’s Special Services, then that’s what it’ll be”. “Do you like Natalie Wood?” asked Miss Laity, forgetting her plans. “A friend”, he said. There was a sigh. “It wasn’t love. Ah don’t wanta fall in love. Ah’m just not lookin’ for somebody”. He took both of them by the hand, and gave a squeeze. “Would you sign our shoes?” asked Miss Dickson. Both girls put up their new white Oxfords and he signed three of them. “Ma, get the other pen”, said Miss Laity in consternation. Elvis finished his signatures. “Don’t believe what you read in those scandal magazines”, he said. “They’re realing choppin’ me and it aint true”. Miss Dickson and Miss Laity looked as if they were about to take up a holy crusade. “I’d like to be your mother”, breathed Miss Dickson. “Babies, ah got to go”, said Elvis. “Ah got to get made up. Ah’ll see you on the set”. Lunch had lasted 32 minutes. At Elvis’ place at the table there remained his glass of milk, three quarters full. Both girls had the same thought. “Do you think he might come back?” asked Miss Laity. “Let’s finish his milk”, said Miss Dickson. And they did. They went back to the set and were saluted by Elvis. This time he was in logger boots and tattered blue jeans. He asked to pose with their mothers. “Us too?” they chorused. “Sure!”, Elvis said. “If there weren’t any mothers, there wouldn’t be any daughters”. Everyone was very pleased. “He isn’t stage struck at all”, said Miss Dickson. Presley at this time was going “brrrrp” into the microphone, “breeeep” on a stray clarinet, and “bingy-bangy-bingy” on his guitar, all to amuse the stage hands. The girls watched the endless rehearsals with untired eyes. Then, Miss Durand said the limousine was waiting to take them back to the airport. With their heads turned backward, they left, tripping over cables and stumbling into extras. Elvis was singing a soft ballad, “Loving You”. Once into the limousine, Miss Laity broke up. She cried all the way to Pico Blvd. “My dream is ended”, she said. “It was too much”, said Miss Dickson, and began to cry too. The crying stopped, but not the sadness. 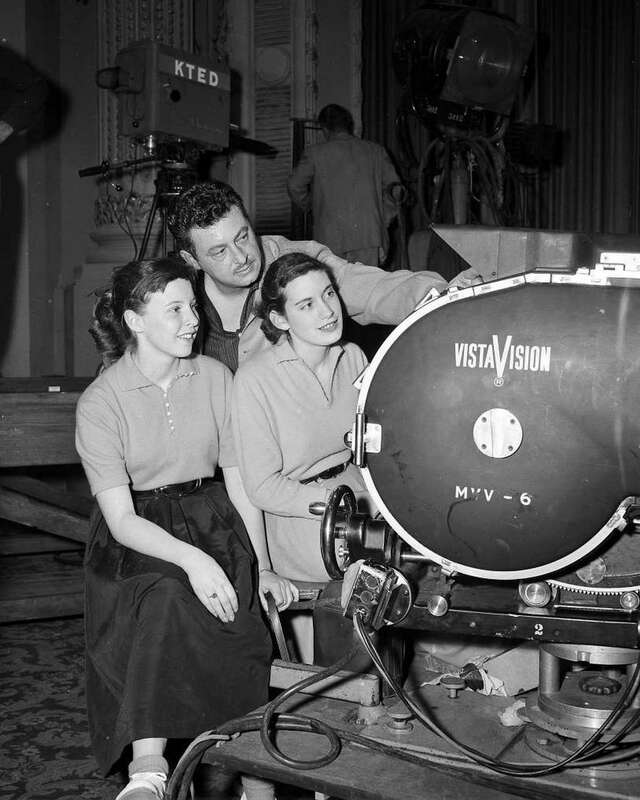 “I’ve got a lump in my throat as big as when I saw ‘The Eddy Duchin Story'”, said Miss Laity. “It’s horrible when you have so much fun and then it’s all over and you feel so bad”, said Miss Dickson. The girls left in a flood of tears, but with some loot. “We sure got a lot of souvenirs, though”, said Miss Laity. Then it became apparent that the two young ladies were as slick as Raffles. They had his milk glass, his water glass, his tray of salted nuts and his napkin. “I’m never washing this hand”, said Miss Dickson. “Which one are you going to save?”. “He used this one the most”, said Miss Laity. “I’m never going to wash this sweater either. He put his arm around it”. “I think I’ll just rot away in the clothes I’m wearing”, said Miss Dickson. Both fell into a catatonic state. At the airport, Mrs. Dickson and Mrs. Laity ordered turkey dinners and a Manhattan. The girls morosely asked for one Seven Up and Coke. “How could you mother?” said Miss Laity, as Mrs. Laity began on the entree. Thanks for your comment Trevor! Full credit for compiling this article goes to Robert van Beek. Thanks, that was a fun read! “the sweetest thing to come along since the invention of strawberry soda”. The follow-up to the 70s is a nice touch. Keep up the good work! “and he was!”. Thank you Judith. 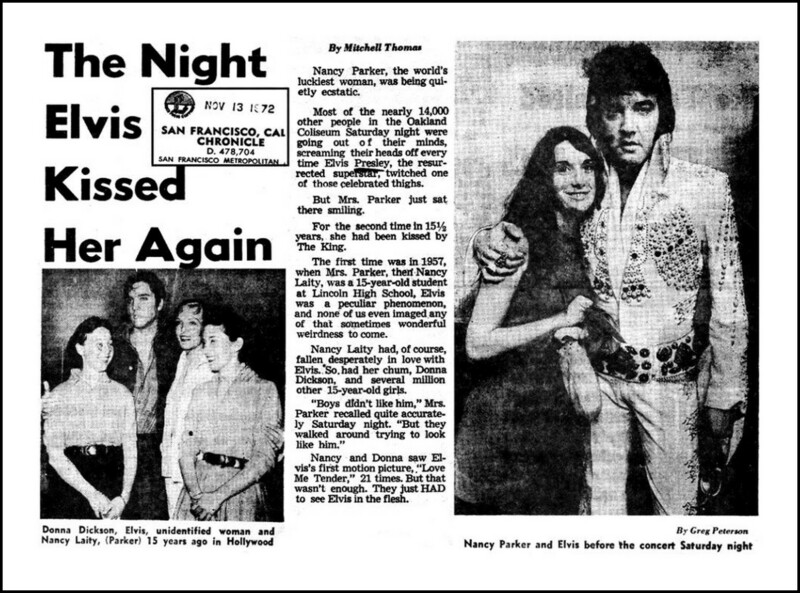 Bob found the wonderful newspaper clipping that has Nancy Parker Laity back on the Elvis trail, again. What an incredible story – I wonder where those girls are now? Never gave it a thought. I wonder, too! Wow, this was a nice read – thanks! You’re welcome Peter, feeling happy putting this together. Lizabeth Scott is surprisingly called “unidentified woman” in the clip from 1972 by the very same reporter that also made the story in 1957……. Thanks for your comment Torben. A small rectification needed: Tom Mathews was assigned in 1957 and the clipping from 1972 was from the hand of Mitchell Thomas. Amazing story! Why is there no mention of how the one sister got to meet EP 15 years later? Did he remember her? And what happened to to the other sister? Where was she when the ’72 meeting took place?